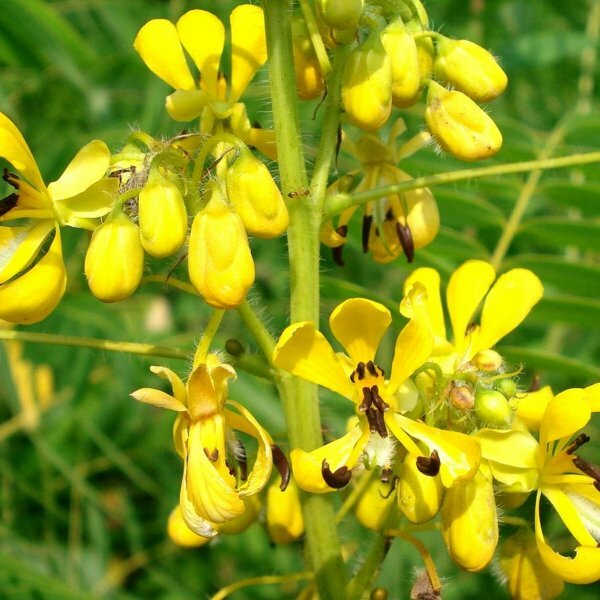 Mid to late summer finds the tall Maryland senna producing glorious clusters of yellow flowers, and the fall and winter months reveal attractive black seed pods. An upright shrubby herbaceous perennial, this wildflower is native to the open woodlands and prairies of the American Southeast and Midwest east of the Great Plains where it thrives in average to fertile soils. Fall frosts kill the plant, but the stems and seed pods persist into the winter before collapsing and decaying. Sprouting from the warm soil in mid- to late spring, Maryland senna becomes an upright plant with little branching. The green to blue-green leaves alternate on the stems. Each leaf comprises numerous oblong leaflets. 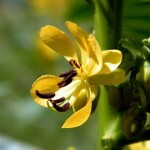 In midsummer, clusters of five-petaled yellow blossoms arise from the upper stems and at the base of the leaves. Bumblebees pollinate the flowers, causing production of seed pods. The short pods turn black and persist into fall, adding visual color and texture. Germination Seed - scarify and then pre-soak the seed for 2 - 3 hours in warm water before sowing it from early spring to early summer in a warm greenhouse. Short cold moist stratification for 20 days will improve the rate and speed of germination. The seed usually germinates in 1 - 12 weeks at 23°c. Prick out the seedlings into individual pots once they are large enough to handle and grow them on in the greenhouse. 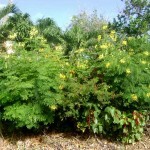 Do not plant them out until the following spring. Division as growth commences in spring. Cuttings of moderately ripe wood, July in a frame.